A crunchy crisp pickle is the ideal topping for just about any summer sandwich and the perfect side to any succulently grilled meal. 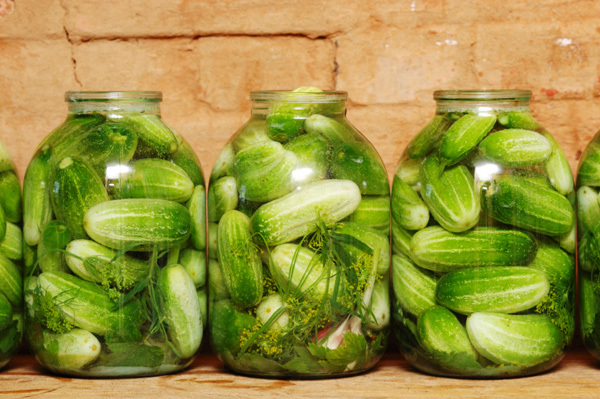 Here is your quick guide to pickling cucumbers and making your own delicious fresh pickles. Homemade pickles take more patience than effort. The wait is quite worth it! stay traditional with Kirby cukes. Regardless of the type of cucumber you choose, just be sure it is bright colored, firm and has no soft or discolored spots. available. The refrigerator method is the easiest method for making pickles: simply combine the ingredients and let them pickle in the refrigerator. Before you cut your cucumbers, rinse them well in cold water. Large cucumbers can be cut any way you like (spears, halves or rounds) while smaller cukes can be left whole. from the cucumbers. Proceed with the pickling process. dills, and bread and butter pickles are the most popular types, but the type you choose is simply a matter of your tastes.